Small Life, Slow Life: Quick Update + Beyond Luon! Oh hey, that’s ME on the right! Wait – what?! I’m speaking at this?! Has it really been a month since I’ve said anything here? Well, it’s been amazing, and busy, and tough. February was filled with connection, hard work, late nights and all things new. Since October, there had been a lot of changes in my life (a major relationship ending, six weeks of living all over the place, questioning who I was and what was ahead of me, and – ahem – the holidays). For a while, I felt completely and totally stuck, trapped in endings with no beginnings in sight. But ever since I rang in the New Year this year meditating at a Buddhist temple (kind of weird – will have to share that story another time), new things have been rushing in. New opportunities, new people, new challenges, a new living space and new risks to take. It’s been exhilarating. And exhausting. 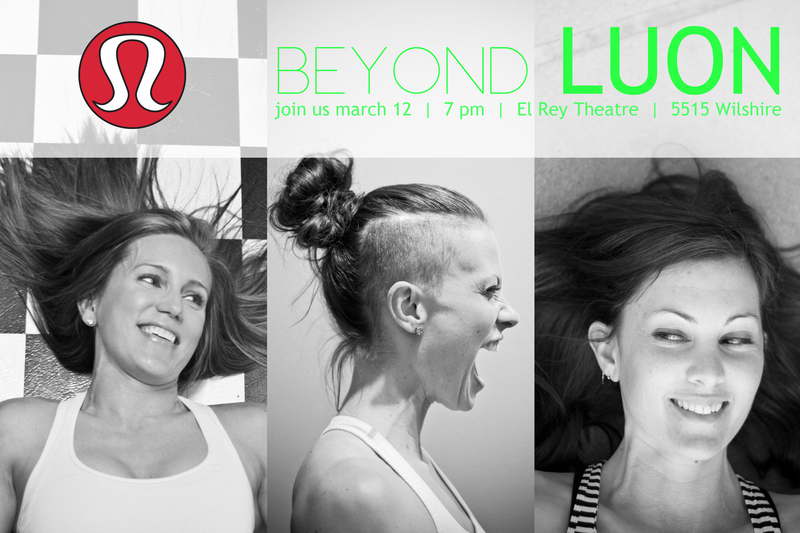 One of the risks I decided to take was applying to speak at Beyond Luon, an event put on by lululemon athletica. “What is a Luon? !” the non-lululemon people are asking. Luon is the fabric. You know, the fabric the black stretchy pants are made of. The pants I fold all day. That’s Luon. And it’s called so because is a Lycra-Nylon blend. And, you know, the company is called lululemon. Thus, luon. I said I’d want to share what it was like to live through the Fukushima earthquake, and how that tragedy, for me, became my biggest triumph. 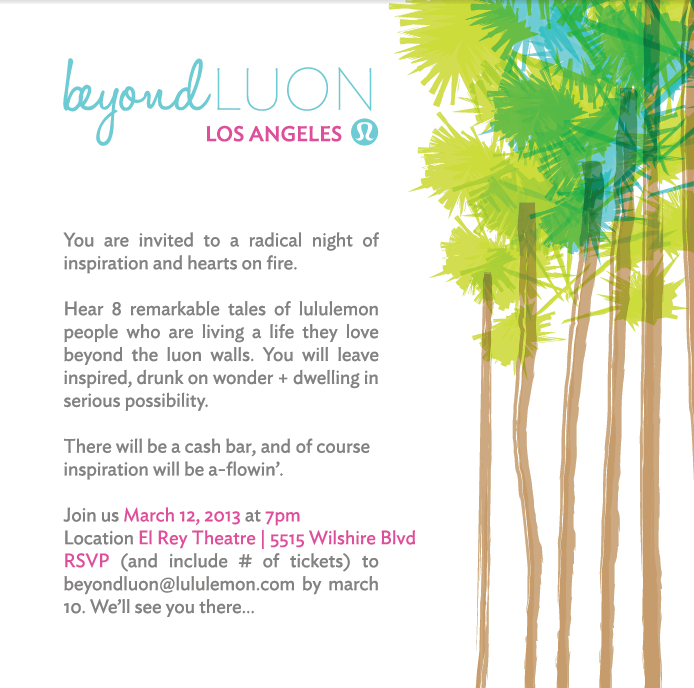 It didn’t feel like a coincidence that Beyond Luon is scheduled for March 12th, which is one day after the two-year anniversary of the quake. You know when life tugs on your sleeve, asking you to do something, and you know it’s going to happen but it feels so big and massive that you get doubtful? Well, I found out on Valentine’s Day that I was chosen to be one of eight to speak. That’s huge, especially because I’m not the greatest public speaker and I’m certain that came across in my video. I was so overwhelmed the moment I saw the email, I broke down in sobs in the manager’s office at work. Co-workers rushed in, assuming something was wrong, and all I could do was shake my head. I don’t usually react when I get big news. I remember when I found out I’d been accepted into Berkeley, and later when I found out I was going to be living in Japan – and both times I just sat there numbly. But this was too much. Luckily, two other amazing women from my store are also speaking – my store manager Michelle and assistant manager Sabrina. That I would ever even be on the same stage as these two powerhouses is mind-blowing to me. And it sounds weird to say, but this is just ONE of the big things that’s happened for me lately. I also attended Landmark Forum (another story I’ll need to share another time), went with my kid sister to San Francisco, applied for a promotion at work and have been giving serious consideration to what my purpose is, and who I want to share the next phases of my life with. It’s big stuff. It’s great stuff! But what comes with that is that I have not had a true day off at home since early February. And I am beat. So hang around here and I’ll be back up and running with more exciting news to share. I’m really proud of you. The only way I can sort of identify with this glorious experience on your journey you are about to have is when I used to read my poems back in the mid 90s at Cafes around Manhattan. I walked into those places feeling so friggin’ nervous; but when I got up behind the mic, the nerves often times disappeared because I was confident in what I was reading. I was confident in my material. Otherwise, I could not have got on those stages. You are confident in Lululemon. You believe in the brand and the company and the work has enriched your life. That will come out in you in a profound way, and I think – when you’re all done, the conversation you will have had with the audience, will have seemed easier than you thought. You have soooooo much life experience to share. So much to give. Much luck to you on March 12th! « Small Life, Slow Life: My birthday, Tegan & Sara, Link Love & More!